A mixture of baby greens, topped with sliced mushrooms, peppers, tomatoes, red onion, cucumber and carrots. Served with a choice of house made dressings. House hickory and maple smoked chicken breast, grilled and served on a bed of greens with tomatoes and cucumbers. Served with a honey dijon vinaigrette and grilled potatoes. Mixed salad greens tossed with grilled chicken, bleu cheese, ripe tomatoes, sliced hard boiled egg, mushrooms and spring onions, served with cobb dressing. Baby romaine greens tossed in Caesar dressing with parmesan cheese and garlic croutons. Garnished with tomatoes, parmesan cheese and white anchovy filets if requested. Enter your email address to receive updated specials and promotions. 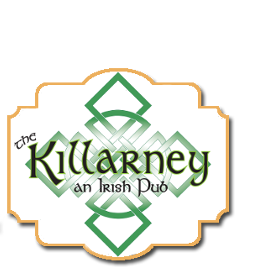 Copyright © 2019 The Killarney. Powered by Webbersaur.us.